NOTES: Resin with wire. Upper stage. Launch Date: 12 April 1961 06:07 GMT. Landing Date: 1961-04-12 07:55:00. Flight Time: 0.0750 days. Call Sign: Kedr (Cedar ). Crew:Gagarin. Backup Crew:Titov,Nelyubov. Location of Capsule: RKK Energia Museum, Korolev, Russia. Of note: First man in space. Record flight duration. Speed (7,844 m/s) and altitude (315 km) records. Three press releases were prepared, one for success, two for failures. It was only known ten minutes after burnout, 25 minutes after launch, if a stable orbit had been achieved. The payload included life-support equipment and radio and television to relay information on the condition of the pilot. The flight was automated; Gagarin's controls were locked to prevent him from taking control of the ship. A key was available in a sealed envelope in case it became necessary to take control in an emergency. After retrofire, the service module remained attached to the Sharik reentry sphere by a wire bundle. The joined craft went through wild gyrations at the beginning of reentry, before the wires burned through. The Sharik, as it was designed to do, then naturally reached aerodynamic equilibrium with the reentry shield positioned correctly. Gagarin ejected after reentry and descended under his own parachute, as was planned. However for many years the Soviet Union denied this, because the flight would not have been recognized for various FAI world records unless the pilot had accompanied his craft to a landing. Recovered April 12, 1961 8:05 GMT. Landed Southwest of Engels Smelovka, Saratov. 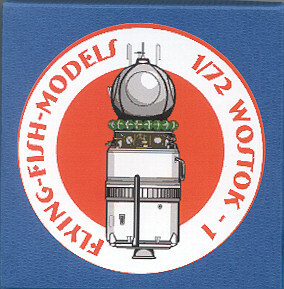 This is the first full kit I've seen from Flying Fish Models and they have chosen a most interesting subject. Real Space kits are few and far between and those of the Soviet Union are even more rare. Flying Fish could not have picked a better subject than the capsule that carried the first man into Space, back over 45 years ago. The Vostok I was a pretty simple spacecraft, consisting of a spherical capsule mounted onto a standard rocket body section that carried its electronics and maneuvering thrusters. Flying Fish have done a superlative job molding this one. The various parts of the kit are right up there with the best resin molding I've ever seen. Several of the parts will fit into place without having to remove the resin pour stubs. Only the main section will need the pour stub cut back. Test fitting some of the parts shows a superbly tight fit. The majority of the smaller bits are the myriad spheres that fit around the upper portion and the four maneuvering thrusters. The smaller spheres need to be drilled out and a section of paper clip installed to keep them in place. 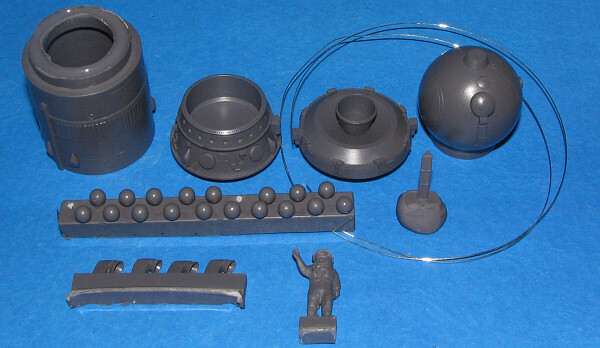 Wire for the various antennas is included as is a scale figure of Yuri Gagarin is also included. Instructions are quite specific and in both German and English. A detailed drawing of the various antenna is also included. I have to confess that I found the antenna diagram to be a bit confusing as I can't tell where the dimensional lines stop and the antenna parts begin. Perhaps it would be a good idea to use a heavier line to show the antennas. Visiting the Flying Fish website will also give the builder a number of additional hints in building and painting this most interesting model. If your interest is in real space, then you simply must have this one to add to your collection. You can get this direct from Flying Fish at their website hyperlinked below. My thanks to Flying Fish Models for the review sample. You can get this fine kit direct from the link above.